BOLD indicates current or former member of the UGEC Scientific Steering Committee, International Project Office, or Project Associate. Seto, K.C., Solecki, W.D., & Griffith, C.A. (Eds.). (2016). 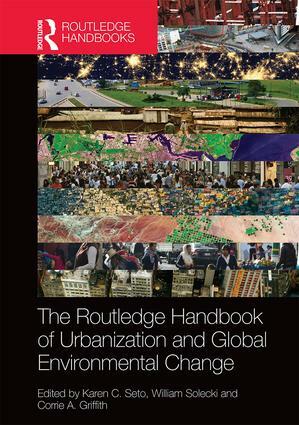 The Routledge Handbook of Urbanization and Global Environmental Change. London: Routledge. Aylett, A., Joeman, B.D., Lefevre, B., Luque-Ayala, A., Rahman, A., Roberts, D., Ward, S., & Watkins, M. (2016). Climate change mitigation in rapidly developing cities. In K.C. Seto, W.D. Solecki, & C.A. Griffith (Eds.). The Routledge Handbook of Urbanization and Global Environmental Change (pp. 549 – 560). London: Routledge. Boone, C.G. & Klinsky, S. (2016). Environmental justice and transitions to a sustainable urban future. In K.C. Seto, W.D. Solecki, & C.A. Griffith (Eds.). The Routledge Handbook of Urbanization and Global Environmental Change (pp. 327 – 335). London: Routledge. Connors, J.P., Griffith, C.A., Nolasco, C.L., Wahab, B., & Mugagga, F. (2016). Urban and peri-urban agriculture: cultivating urban climate resilience. In K.C. Seto, W.D. Solecki, & C.A. Griffith (Eds.). The Routledge Handbook of Urbanization and Global Environmental Change (pp. 421 – 440). London: Routledge. Deng, X.Z. (2016). Urbanization and impacts on agricultural land in China. In K.C. Seto, W.D. Solecki, & C.A. Griffith (Eds.). The Routledge Handbook of Urbanization and Global Environmental Change (pp. 42 – 49). London: Routledge. Elmqvist, T., Zipperer, W.C., & Güneralp, B. (2016). 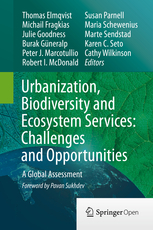 Urbanization, habitat loss and biodiversity decline: solution pathways to break the cycle. In K.C. Seto, W.D. Solecki, & C.A. Griffith (Eds.). The Routledge Handbook of Urbanization and Global Environmental Change (pp. 139 – 151). London: Routledge. Fragkias, M. (2016). Urbanization, economic growth and sustainability. In K.C. Seto, W.D. Solecki, & C.A. Griffith (Eds.). The Routledge Handbook of Urbanization and Global Environmental Change (pp. 9 – 26). London: Routledge. Grimmond, C.S.B., Ward, H.C., & Kotthaus, S. (2016). Effects of urbanization on local and regional climate. In K.C. Seto, W.D. Solecki, & C.A. Griffith (Eds.). The Routledge Handbook of Urbanization and Global Environmental Change (pp. 169 – 187). London: Routledge. Güneralp, B. (2016). Resource use for the construction and operation of built environments. In K.C. Seto, W.D. Solecki, & C.A. Griffith (Eds.). The Routledge Handbook of Urbanization and Global Environmental Change (pp. 77 – 92). London: Routledge. Huang, S.L. & Wang, S.H. (2016). Spatial planning: an integrative approach to climate change response. In K.C. Seto, W.D. Solecki, & C.A. Griffith (Eds.). The Routledge Handbook of Urbanization and Global Environmental Change (pp. 364 – 376). London: Routledge. Leichenko, R.M. & Solecki, W.D. (2016). Suburban landscapes and lifestyles, globalization and exporting the American dream. In K.C. Seto, W.D. Solecki, & C.A. Griffith (Eds.). The Routledge Handbook of Urbanization and Global Environmental Change (pp. 125 – 138). London: Routledge. Lwasa, S. (2016). Climate change mitigation in medium-sized, low-income cities. In K.C. Seto, W.D. Solecki, & C.A. Griffith (Eds.). The Routledge Handbook of Urbanization and Global Environmental Change (pp. 406 – 420). London: Routledge. Marcotullio, P.J. (2016). Urbanization, energy use and greenhouse gas emissions. In K.C. Seto, W.D. Solecki, & C.A. Griffith (Eds.). The Routledge Handbook of Urbanization and Global Environmental Change (pp. 106 – 124). London: Routledge. Mitra, C., Pandey, B., Allen, N.B., & Seto, K.C. (2016). Contemporary urbanization in India. In K.C. Seto, W.D. Solecki, & C.A. Griffith (Eds.). The Routledge Handbook of Urbanization and Global Environmental Change (pp. 64 – 76). London: Routledge. Mitra, C. & Shepherd, J.M. (2016). Urban precipitation: a global perspective. In K.C. Seto, W.D. Solecki, & C.A. Griffith (Eds.). The Routledge Handbook of Urbanization and Global Environmental Change (pp. 152 – 168). London: Routledge. Murray, S., Brock, S., & Seto, K.C. (2016). Urbanization, food consumption and the environment. In K.C. Seto, W.D. Solecki, & C.A. Griffith (Eds.). The Routledge Handbook of Urbanization and Global Environmental Change (pp. 27 – 41). London: Routledge. Seto, K.C. & Solecki, W.D. (2016). Conclusion: the road ahead for urbanization and sustainability research. In K.C. Seto, W.D. Solecki, & C.A. Griffith (Eds.). The Routledge Handbook of Urbanization and Global Environmental Change (pp. 561 – 575). London: Routledge. Simon, D. (2016). The potential of the green economy and urban greening for addressing urban environmental change. In K.C. Seto, W.D. Solecki, & C.A. Griffith (Eds.). The Routledge Handbook of Urbanization and Global Environmental Change (pp. 421 – 440). London: Routledge. Romero-Lankao, P. & Gnatz, D. (2016). Urbanization, vulnerability and risk. In K.C. Seto, W.D. Solecki, & C.A. Griffith (Eds.). The Routledge Handbook of Urbanization and Global Environmental Change (pp. 213 – 228). London: Routledge. Sanchez-Rodriguez, R. (2016). Adaptation to climate change in rapidly growing cities. In K.C. Seto, W.D. Solecki, & C.A. Griffith (Eds.). The Routledge Handbook of Urbanization and Global Environmental Change (pp. 350 – 363). London: Routledge. Trundle, A. & McEvoy, D. (2016). Urban greening, human health and well-being. In K.C. Seto, W.D. Solecki, & C.A. Griffith (Eds.). The Routledge Handbook of Urbanization and Global Environmental Change (pp. 276 – 292). London: Routledge. Seto, K.C. & Reenberg, A. (Eds.) (2014). Rethinking Global Land Use in an Urban Era. MIT Press: Cambridge. Simon, D. & Parnell, S. (2014). National urbanization and urban strategies: necessary but absent policy instruments in Africa. In S. Parnell, E. Pieterse (Eds.) Africa’s Urban Revolution. pp. 237-256. London and New York: Zed Books. Boone, C.G. & Fragkias, M. (Eds). (2013). 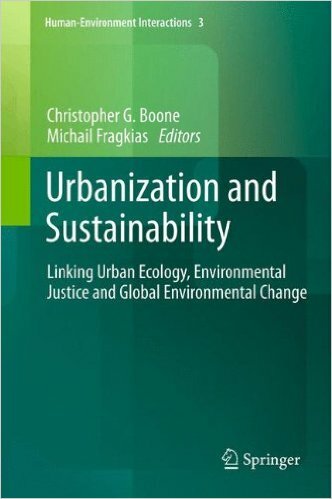 Linking Urban Ecology and Environmental Justice in an Era of Global Environmental Change. Springer Netherlands. Bulkeley, H. (2013). 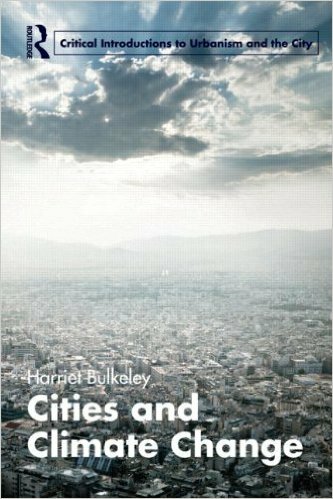 Cities and Climate Change (Routledge Critical Introductions to Urbanism and the City). London: Routledge. Deng, X.Z. (2011). 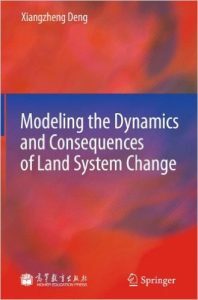 Modeling the Dynamics and Consequences of Land System Change. Springer. 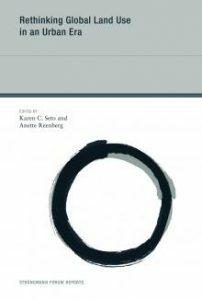 Rosenzweig, C., Solecki, W.D., Hammer, S.A., & Mehrotra, S. (Eds). (2011). Climate Change and Cities: First Assessment Report on the Urban Climate Change Research Network. Cambridge University Press. Bulkeley, H. & Newell, P. (2010). Governing Climate Change (Global Institutions). London: Routledge. Lwasa, S. (2010). Urban Land Markets, Housing Development and Spatial Planning in Sub-Saharan Africa: A Case of Uganda. New York: Nova Science Publishers Inc.
Fra Paleo, U. (Ed.) (2009). Building Safer Communities. Risk Governance, Spatial Planning and Responses to Natural Hazards. Amsterdam: IOS Press. Pelling, M. & Wisner, B. (2008). Disaster Risk Reduction: Cases from Urban Africa. London: Earthscan. Schipper, E.L.F. & Burton, I. (2008). The Earthscan Reader on Adaptation to Climate Change (Earthscan Reader Series). Routledge. Schipper, E.L.F. & Burton, I. (2008). The Earthscan Reader on Adaptation to Climate Change (Earthscan Reader Series). Routledge. Douglass, M., Ho, K.C. and Ooi, G.L. (eds.) (2007) Globalisation, the City and Civil Society in Pacific Asia. London: Routledge. Douglass, M., Ho, K.C. and Ooi, G.L. (eds.) (2007) Globalisation, the City and Civil Society in Pacific Asia. London: Routledge. Sanchez Rodriguez, R. & Bonilla, A. (eds.) (2007). Urbanization, Global Environmental Change, and Sustainable Development in Latin America. Inter American Institute for Global Change Research (IAI), Instituto Nacional de Ecologia (INE), & United Nations Environment Programme (UNEP). Marcotullio, P. & McGranahan, G. (2006). Scaling Urban Environmental Challenges: From Local to Global and Back. London: Earthscan. Marcotullio, P. & McGranahan, G. (2006). Scaling Urban Environmental Challenges: From Local to Global and Back. London: Earthscan.